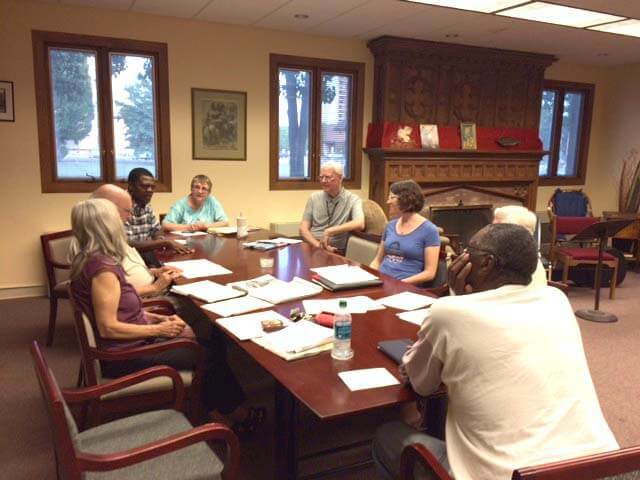 Coming October 26 is the ISAAC Issues Convention, and at our August meeting, the Anti-Racism Task Force leaped into preparations. ARTF member Deacon Karen McDonald shared copies of the first draft of an issues convention skit. It will show why anti-racism work ought again be an ISAAC issues focus for the coming two years. Task force members will make suggestions by email on ways to make the sketch even better. Rehearsals will begin at the September ARTF meeting. ISAAC-ARTF has partnered with Eliminating Racism And Creating/Celebrating Equity (ERACCE), the Kalamazoo-based anti-racism training organization, to present two series of workshops. One, called Health Equity, shows with historical and current data that persons in different classes of wealth and economic power and in different race-defined castes have unequal access to health care and to health problems preventive measures. See the separate article in this newsletter for details about the Health Equity workshop on October 6. The other workshop, Critical Cultural Competency, is being developed by ISAAC-ARTF and ERACCE with Employer Resource Network Michigan (ERN-MI) to help employers address biases that are obstacles to effectively recruiting and retaining employees of color. Most of those who attended the August ARTF meeting participated in the August 12 and 13 Listening Engagement weekend. Anecdotal indications are that in predominantly white neighborhoods, the racial makeup of a survey team—all white, black and white, or all black—made a higher to lower difference in the percentage of doors knocked on that were opened. Those who opened their doors and spoke with the ISAAC Listening Engagement teams were, with rare exception, cordial and glad to participate in the survey. Racism was a frequently chosen issue of concern. The ISAAC Anti-Racism Task Force is co-chaired by Al Dixon and Kristin Duffy. We meet monthly on third Tuesdays from 6:30 to 8:00 PM, in the library of St. Luke’s Episcopal Church, 247 W. Lovell St., between Rose and Park Streets, in downtown Kalamazoo. If you are concerned about the persistence in America of inequities and prejudices due to violently or subtly imposed norms of white privilege, join ARTF. More members means more ideas and person-power for anti-racism work. In multi-racially doing anti-racist work, we learn to recognize, confront, and decrease racist notions in ourselves.